Caribbean cooking is influenced by a wide variety of cultures and regions, and includes styles from African, Cajun, Creole, Portuguese, Spanish, Latin American, South Asian and Indonesian cuisines. Some common ingredients found in Caribbean dishes include rice, plantains, beans, cassava, cilantro, bell peppers, garbanzo beans, tomatoes, sweet potatoes, and coconut. Beef, chicken and pork are common meats and a variety of fish can be found thanks to the Caribbean Sea. The Caribbean recipes in this collection include nutritional information to make diabetic meal planning easier. 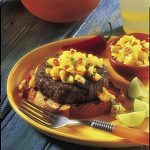 Recipe for Tropical Salsa from our Sauces and Condiments recipe section. 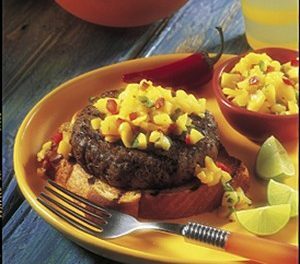 Recipe for Jamaican Jerk Chicken Kabobs from our Main Dish recipe section. 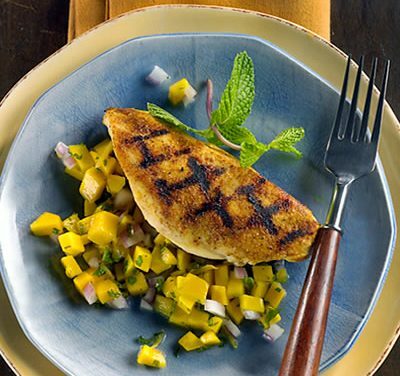 Recipe for Swordfish with Mango Coriander Salsa from our Main Course recipe section. 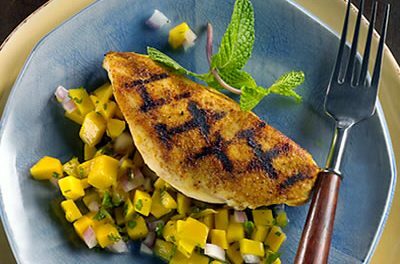 Recipe for Pan-Seared Pork with Mango Salsa from our Main Dishes recipe section. Recipe for Teriyaki Tofu Kabobs from our Main Dishes recipe section. Recipe for Seafood Kabobs Hawaiian from our Main Dishes recipe section. Recipe for Caribbean-Style Flounder from our recipe section. Use vegetables in wraps, which hold better than sandwiches if you keep the wrapper flexible and don’t overstuff them. The following recipe uses cream cheese and a lettuce leaf to prevent the moist filling from turning the wrapper soggy. Cold wraps usually improve in flavor by sitting in the refrigerator overnight. Recipe for Tuna Salad Wrap from our Sandwiches and Wraps recipe section.